A Conference to Challenge the Wars of the 1% Against the 99% at Home and Abroad—this banner heads the call for the United National Antiwar Coalition Conference, which will be held in Stamford, CT, on March 23-25. Addressing this theme will be international guest speakers that include Xiomara Castro de Zelaya, the wife of the former Honduran president ousted by a U.S.-backed coup and the just named presidential candidate of the new party of the Honduran resistance known as Libertad y refundación; Fignole St. Cyr of the Haitian Autonomous Workers Confederation; and Andrew Murray, a member of the British Trades Union Congress Executive Council, a leader of the Nov. 30 general strike over pensions, and the head of the UK Stop the Wars Coalition from 2002-2011. On hand to help draw the links between the potential of the Occupy Movement and the fight against U.S. wars and austerity will be Clarence Thomas, a longshoreman from Oakland, Calif., who helped to lead the campaigns in defense of the Longview ILWU strikers against the union-busting company EGT, and Scott Olsen, the Iraq war veteran and occupier whose injury by the Oakland police alerted the nation to the connections between the wars at home and abroad. The war at home on the Black community will be addressed at a major lunch-time plenary panel headlined by Glen Ford of Black Agenda Report, Dr. Khalilah Brown-Dean of Quinnipiac College, Pam Africa, and the hip-hop scholar-agitator Jared Ball. Imam Abdul Malik Mujahid of the Muslim Peace Coalition, Monami Maulik of Desis Rising Up and Moving, James Yee, who once served as a Muslim chaplain at Guantanamo, and Cyrus McCormick of the New York City chapter of the Council of American Islamic Relations will help orient attendees to the centrality of the fight against Islamophobia, preemptive prosecution, and indefinite detention. In short, the new political possibilities and new challenges opened by the autumn explosion of the Occupy Movement, the mass protests against austerity occurring worldwide, and the U.S. government’s drive toward new and deepening military interventions in Iran, Africa, and East Asia have shaped the politics and organization of the conference dramatically. Unlike previous national antiwar conferences that focused more exclusively on the occupations in Iraq and Afghanistan, the UNAC conference is necessarily organized around providing education and space for analysis of the new geographic scope of imperialism’s increasingly desperate belligerence. The opening session on Friday night, entitled “Shifting Strategies of Empire: Analyzing the Military and Economic Plans of the 1%,” will allow experts and activists such as Col. Ann Wright, David Swanson, BAYAN leader Bernadette Ellorin, Abayomi Azikiwe of the Pan-Africa Newswire, Kazem Azim of Solidarity Iran, Adaner Usmani of the Labor Party of Pakistan, Jeff Mackler, and others to explain the manner in which the U.S. threats against Iran and Syria are linked to the so-called “Return to Asia” and the step up of operations on the African continent. The remainder of the conference will be taken up with plenary sessions in which attendees will consider and modify a draft Action Plan for united national antiwar activities for the coming months and over 40 educational workshops. At the center of the Action Plan is a proposal for a mobilization for a May 19 permitted march in Chicago in response to the NATO/G8 summit being hosted there. Representatives of the umbrella coalition organizing May 19, called CANG8 or the Coalition Against NATO/G8 Wars and Poverty Agenda, will be on hand to motivate national involvement. The Action Plan, which is available at http://www.unacpeace.org, is now being circulated nationally, and proposed amendments and counterposed resolutions are being accepted for the gathering’s consideration. Some of the most innovative panels bring together the fights of immigrant workers and social justice activists globally. These include two workshops organized by Desis Rising Up and Moving: “Border Militarization/Migrant Workers Rising Globally” and “From Egypt to New York City: “Anti-Radicalization” Laws, Surveillance, the War on Terror Industrial Complex.” The theme of building solidarity between the Occupy Movement, the labor movement, and antiwar initiatives is interwoven throughout the workshop sessions. Those interested in attending the conference and organizing others to attend will find registration, housing, and transportation information online at http://www.unacpeace.org. UNAC is attempting to raise scholarship funds and will gratefully accept donations for the registration and housing of students and the unemployed. Information about how to submit amendments and resolutions will be found on this website as well. 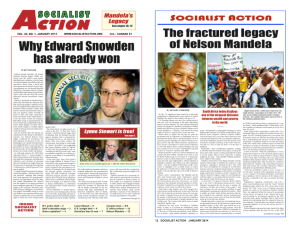 > The article above was written by Christine Marie, and first appeared in the February 2012 print edition of Socialist Action newspaper. ← What sort of third party do we need?